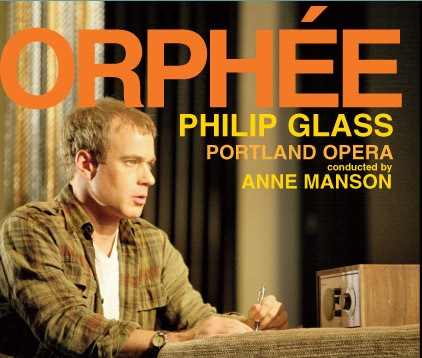 Orange Mountain Music presents the world premiere recording of Philip Glass’ opera Orphée performed by a renowned cast of soloists including Philip Cutlip as Orphée, Lisa Saffer as la Princesse, and the Portland Opera Orchestra conducted by Anne Manson. Orphée (1993) was the first of a trilogy of operas that Glass composed on subjects by Jean Cocteau including also La Belle et la Bête (1994) and Les Enfants Terribles (1996). Orphée is the last to the trilogy to be recorded, and received fine treatment here with a Michael Riesman produced recording made from a series of live performances that took place in November 2009. This two-disc set includes the a deluxe digipack, full libretto in French and English, color production photos and cast and performer biographies. Based on Cocteau’s fascinating retelling of the Orpheus myth, Orphée, the first opera of Philip Glass’ Cocteau Trilogy, is an extended parable on the life of an artist, a poet harassed and misunderstood by peers. His success leads to the ridicule by fellow poets, ending in a creatively crippling isolation. With a renewed apprehension of his own mortality, Orphee regains his emotional strength, enabling him to ignore the trials of ordinary life, freeing him to be a poet. The poets Orphée and Cégeste, Euridice, and a mysterious Princess interact within the worlds of the living and the dead, existing in that mysterious realm that separates the two worlds. Love triumphs and thus returns Orphée and Euridice to mortal life, with no remaining consciousness of their unusual time spent between “the worlds”. The Princess has violated the laws of life and death one time too many and is banished into oblivion. Itaipú and three Songs are published by Dunvagen Music Publishers, Inc. (ASCAP). ℗ and © 2010 by Orange Mountain Music.